September 29, 2018, 6:23 p.m.
On Thursday, much of America was riveted by testimony of Christine Blasey Ford and Brett Kavanaugh before the Senate Judiciary Committee. Starting Thursday night and continuing through Friday evening, YouGov interviewed 2,607 Americans about whom they thought was telling the truth or lying. We found a country deeply divided in their reactions to the hearings. The largest group believed Ford was telling the truth and Kavanaugh was not. A smaller, but still substantial group, believed the opposite. Hardly anyone believed both were telling the truth. Where you came out depended mostly on where you came in. Women were more likely to think that Kavanaugh was lying, but, for the most part, reactions followed partisan lines. So far, at least, there appears to have been little net movement in support for Kavanaugh’s confirmation. More people thought that Christine Blasey Ford was telling the truth than did Brett Kavanaugh. 41% thought Ford was “definitely” or “probably telling the truth,” compared to 35% for Kavanaugh. About a quarter were unsure about both. It is hard to believe that Democrats and Republicans were watching the same hearings. 73% of Democrats thought Ford was telling the truth, compared to only 14% of Republicans. 74% of Republicans thought Kavanaugh was telling the truth compared to only 11% of Democrats. Independents were in between, with slightly more believing Ford (33%) than Kavanaugh (32%) and higher percentages not sure about either. While President Trump and most Republicans said that they thought the testimony of both Ford and Kavanaugh to be “very credible,” this tendency to believe both the accuser and the accused were telling the truth was not shared by the public at large. Only 5% of survey respondents thought that both Ford and Kavanaugh were telling the truth. 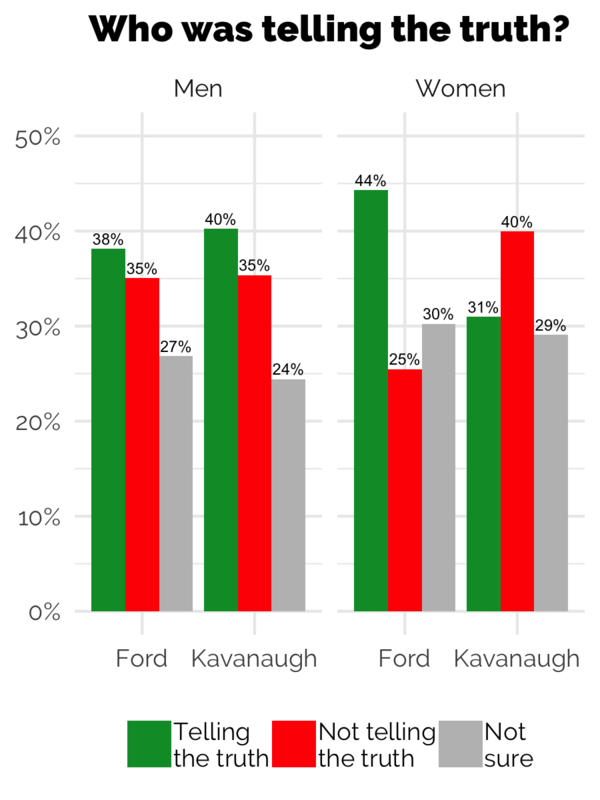 33% though Ford told the truth and Kavanaugh was lying, while 26% though the reverse. The remaining third of the public consisted of 23% who were not sure about both, 7% who believed one, but were unsure about the other, 4% who thought both were lying, and 2% who disbelieved one and were unsure about the other. There was a moderate gender gap between the reactions of men and women. Women were more likely than men to think Ford was telling the truth (44% vs. 38%), while men were more likely to think Kavanaugh was telling the truth (40% vs. 31%). This is similar in size to the gender gap seen in partisanship. However, there is some evidence that women and men reacted differently to Kavanaugh’s testimony beyond just partisanship. Both Republican and Democratic men were more likely to believe Kavanaugh than women of the same party. For instance, 78% of male Republicans thought Kavanaugh was telling the truth, compared to only 71% of female Republicans. Democrats were much less likely to believe Kavanaugh, but Democratic men were more likely to believe him than Democratic women (14% vs. 9%). The pattern of reactions to Ford is different. There was no difference between either Democratic men and Democratic women or Republican men and Republican women in the percentage saying Ford was telling the truth. But we do see a greater tendency of men of both parties to say that Ford was lying. 69% of Republican men say Ford was not telling the truth, compared to 59% of Republican women. 11% of Democratic men say Ford was not telling the truth, compared to 8% of Democratic women. 27% of Republican women were unsure about the truthfulness of Ford’s testimony, suggesting some risk to Republican unity if additional evidence is uncovered next week. The other problem for Republicans is that the hearings are more salient to #metoo voters. We asked respondents “Thinking about the 2018 midterms, how important will issues related to the Supreme Court be in deciding your vote?” 52% of those who believed Ford said that the Supreme Court will be a more important factor in how they vote, compared to only 44% of those who thought she was not telling the truth. This is an issue that motivates Democrats more than Republicans. Overall, however, there appears to be little movement in support for Kavanaugh’s confirmation as a result of the hearings. 1,151 of the respondents in this survey had been interviewed for our September 22 survey for the Economist and were asked both times whether the Senate should confirm Kavanaugh as a Supreme Court Justice. 80% of respondents gave the same answer in both surveys and there was almost no net movement in one direction or the other. 15% of prior Kavanaugh supporters switched to opposed or undecided and 16% of prior Kavanaugh opponents switched to supporters or undecided. 18% of those who were undecided switched to opposition and 17% to support. Overall, we still show more opponents (41% opposed to confirmation, 36% in favor) -- no significant change from our prior poll.